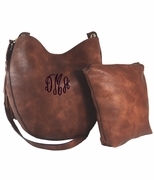 Personalized faux leather handbag tote. Add this gorgeous British tan southwestern design handbag to your collection. A quality constructed purse tote with contrast stitching around the outer edge and V shaped with accent studs. Unique side tassel with plenty of pockets for organizing inside... A beautiful bag for any ensemble. 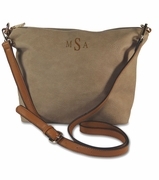 ADD OUR NEW ACCENT MONOGRAM 1" HIGH JUST BELOW THE TOP EDGE BETWEEN THE HANDLES. 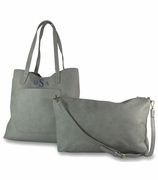 The leather Southwest handbag tote measures 12"W x 11.5"H. Zipper closure.